Four months without an entry? Does that even constitute a blog? Among my New Year’s Resolutions (there will be some this year, for a change), is to get back to blogging. I’ve done a poor job of late, especially with my half-hearted attempts at a daily “Michigan Etsy Shop of the Day” over on Monkita Knits. Not without good reason, I suppose. I’ve been nannying and knitting myself ragged. I see the light at the end of the Christmas-rush-order tunnel and I’m going to start with a few blogs in the next week or so (hopefully). For months I’ve been taking pictures of the delicious things I’ve been cooking (though few and far between), so now it’s time to go back through iPhoto and catch up. 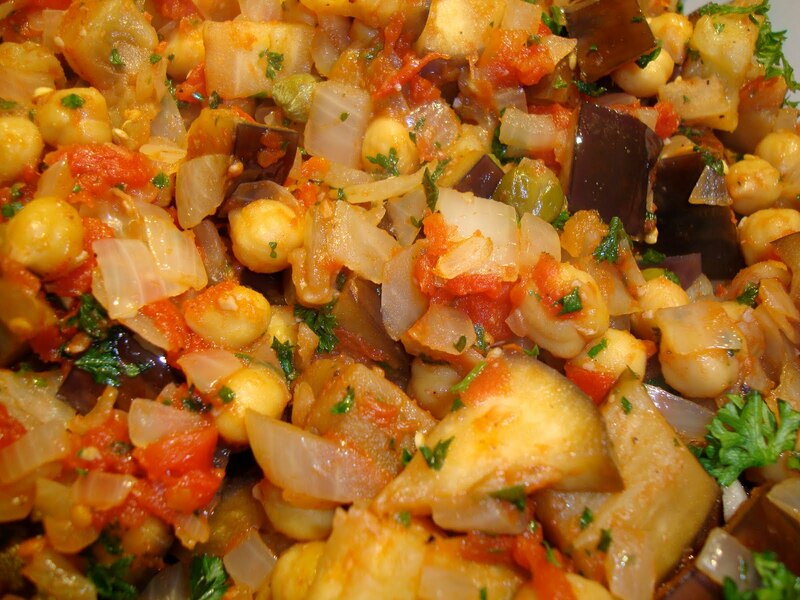 Eggplant can be a good hearty meat substitute and it’s full of antioxidants. It’s very good for people looking to lower their cholesterol too. 1. Half and seed eggplants. Cut into 3/4-inch chunks and toss with salt in a bowl. Let sit for 30 minutes, then drain, rinse and pat dry. This draws out the bitter juices of some eggplants and helps it hold its shape and not get mushy while cooking. 2. Heat olive oil in a large saucepan over medium heat. Add onion and saute about 5 minutes, until softened. Add garlic and cook 1 minute more, until fragrant. 3. 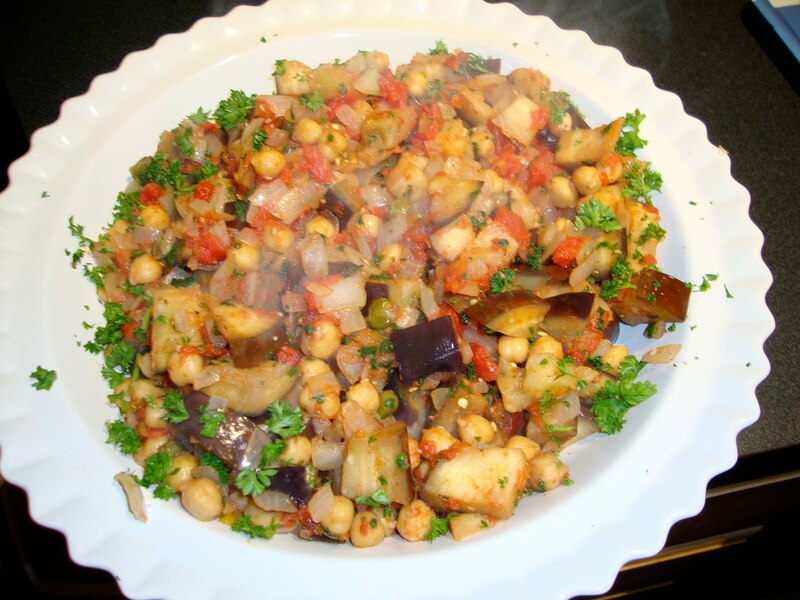 Stir in tomatoes, chickpeas and eggplant. Reduce heat to medium-low and cook 15 minutes or until eggplant is tender but not mushy. I stirred mine often to make sure everything cooked as evenly as possible. 4. Stir in capers and sugar, and cook about 2 minutes more. Fold in parsley and season with black pepper. On the side that night, I made some crispy rosemary potatoes, so I figured I’d take a picture of those too! 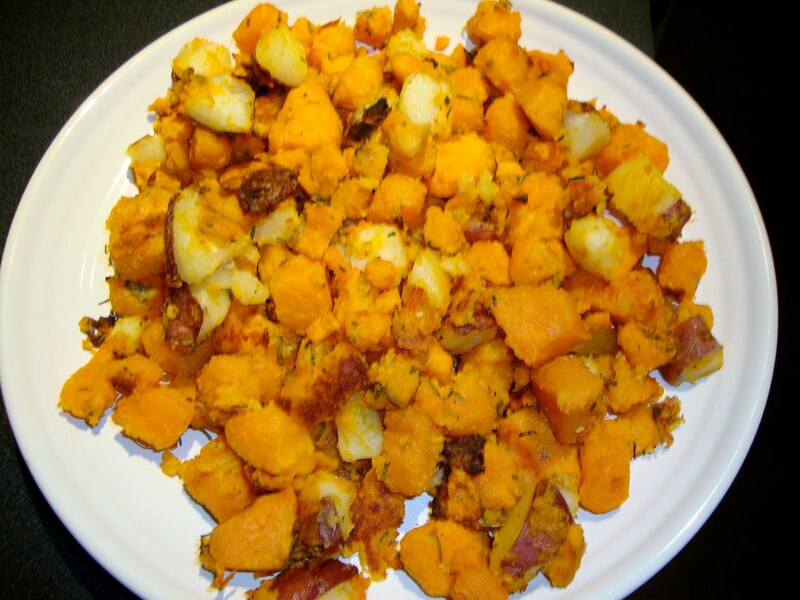 Cut up any combination of potatoes you like — I used a few sweet potatoes and a couple of large redskin potatoes. 1. Peel potatoes (I left the skin on my reds) and cut into about 1-inch chunks. 2. Put in pot and fill with water until potatoes are just covered. Bring to a boil and let boil for about 5 minutes. 3. Drain and return to pan. Toss in 2-3 Tbsp. of butter and a drizzle (about 1 Tbsp.) of olive oil and coat potatoes. 4. Chop fresh rosemary (how much is up to you — I used quite a bit and it still didn’t seem like very much! ), add to potatoes, along with salt and pepper to taste. 5. Spray a couple of cookie sheets/cake pans with PAM if you have it, then spread potatoes in a single layer. Bake for about 20 minutes, tossing at least once, until your desired crispiness is reached. They are flavorful and delicious! Entry filed under: Main Dish. Tags: Recipes, vegan, vegetarian. Cass Cafe: Go now! Best kale dish and super easy too!